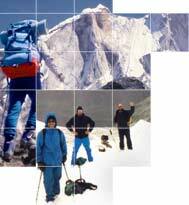 of mountaineering, travel and living in this particular region of Himalaya. The three of us also accompany the expedition throughout. We do have an itinerary and a selection of planned activities. But based on the individuals actually joining the expedition, we will adjust the programme to make it just as adventurous as the group requires. Added to this is that we travel in a land that doesn’t necessarily adjust to our schedules and fixed arrangements; it will be part of the adventure to change our plans if local uncontrollable conditions so force us. Some parts of the expedition will be demanding, physically as well as mentally. You should come prepared to experience some hardship along the way, that is the nature of adventure in this part of the world. But it is all within the limits of what an average, normally fit person can well manage. The expedition is an opportunity to get acquainted with an unusually interesting and exotic culture, and an environment which does not exist anywhere else in the world, and YES, you can do it! The expedition applies a specific code of ethics with regard to environmental, social and cultural conduct. No physical trace of our trek is left behind, and the porters we employ are all from the villages in the area, this way the money we pay for wages will benefit the villages which we actually visit. The wage levels are those specified by the local unions, and all porters are properly equipped and insured. We also apply a code of conduct with regard to cultural contacts and behaviour, aimed at minimising any negative impact that the expedition might have on local culture. Participating in the expedition will cost you 1 950 Euro. This includes all transportation, food, accommodation, camp facilities, climbing gear, and climbing and trekking instruction, for the entire period of 20 days from Delhi and back. All you need to bring is your personal gear and clothing (see equipment list) and pocket money. The price also includes a rock climbing instruction session on Häggstaberget in Sweden provided by either Peter Bosma or Ingela Nilsson, two top Swedish sport climbers. The price is based on actual cost. You will, however, be invited to contribute to the development process in Osla village. If you are interested in joining or if you want more information mail us, call + 46707302832 or Skype akenilssongeoscope. Looking forward to having you as a member!